Last May, APOPO’s Dar es Salaam TB laboratory was honored by a high-level visit from the Permanent Secretary of the UK’s Department for International Development Matthew Rycroft and the British High Commissioner to Tanzania, Her Excellency Sarah Cooke. Nine trained TB detection rats are deployed at the Dar es Salaam testing facility within a research project, to re-evaluate human sputum samples collected from 41 surrounding TB clinics. The rats, followed up with WHO-endorsed confirmation tests, contribute to the detection of over 100 additional previously missed TB cases every month. Confirmed results are conveyed to clinics which orchestrate patient treatment. The British High Commissioner to Tanzania, H.E. Sarah Cooke, also expressed interest in seeing with her own eyes how APOPO’s four-legged co-workers begin their careers and duly visited our headquarters, training and R&D center based at, and in partnership with, the Sokoine University of Agriculture (SUA) in Morogoro. It was here that H.E. 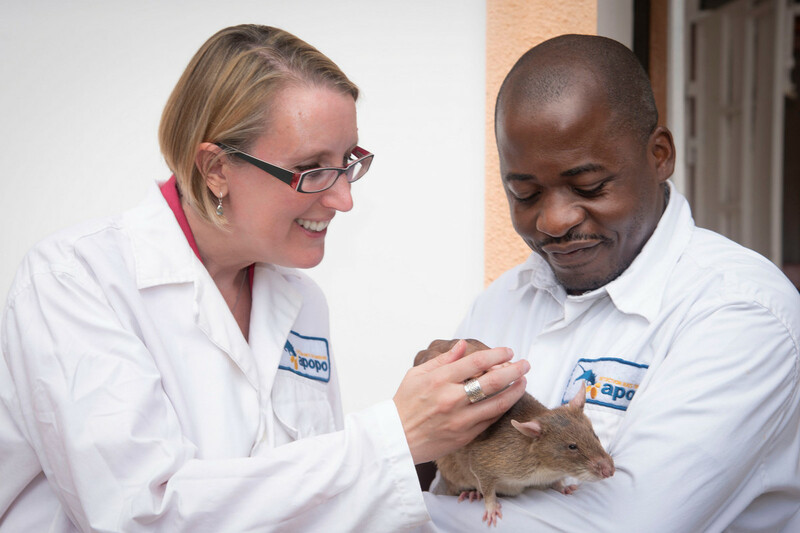 Sarah Cooke witnessed the socialization of baby rats, and the early TB training of our TB detection young rats. She also experienced operational TB detection rats who investigated 50 heat-inactivated sputum samples for TB in less than 5 minutes. The tour led by APOPO’s Tanzania TB Program Manager Dr. Georgies Mgode, spanned all steps of the TB diagnostic research. H.E. Sarah Cooke also experienced another exciting new area of animal detection research in collaboration with the Endangered Wildlife Trust (EWT) of South Africa and supported by the UK Illegal wildlife Trade Challenge Fund: the detection of illegal wildlife products. APOPO is researching the use of detection rats to support anti-trafficking of pangolin and rare hardwoods. A warm welcome by Prof. Raphael Chibunda, the Vice Chancellor of SUA, Prof. Yonika Ngaga, the Deputy Vice Chancellor – Finance and Administration, and Dr. Ladslaus Mnyone, Director of SUA’s Pest Management Center hosting the African Centre of Excellence for Innovative Rodent Pest Management and Biosensor Technology Development, completed the SUA visit and emphasized how capacity building and innovation go hand in hand. APOPO greatly acknowledges UKAID and HDIF support to our TB detection work in Tanzania, as well as the U.K. Illegal Wildlife Trade Challenge Fund contribution to the illegal wildlife detection research.